What can a Dubai restaurant do to stand out in an ever-evolving landscape of dishes? 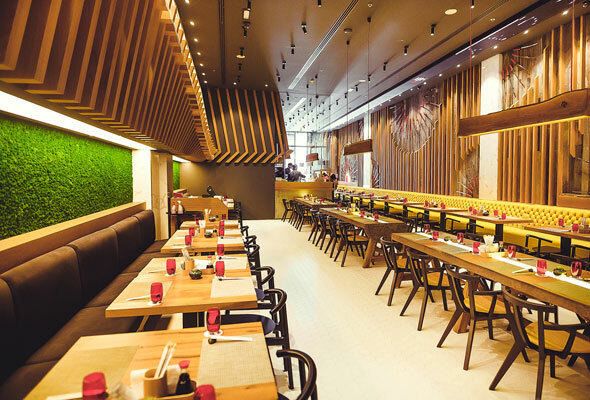 Well, just ask Tanuki, the new pan-Asian restaurant at The Dubai Mall. The new restaurant has replaced The Noodle House and boasts both indoor and outdoor seating, facing out towards the Dubai Fountain and Burj Khalifa. But the wow-worthy moments start at the entrance to this new restaurant, where guests will be greeted by a robot hostess. As well as greeting guests at the entrance, the Tanuki robot can interact with customers, and little ones are encouraged to greet the robot who can get little ones laughing with a song and dance. The restaurant itself is a narrow space, and while most indoor seats boast views of the chefs at work in the preparation area, we’d pick a table on the terrace every time, which comes complete with views of the Burj Khalifa. While Tanuki is unlicensed, they’ve got an excellent array of mocktails on offer which include inventive options such as avocado mint and lemongrass mandarin iced tea (Dhs25 each). The food menu is extensive, with extensive sushi and sashimi options as well as dedicated sections for salads, poke and terriyaki. A sashimi platter (Dhs140) is a generous array of fresh pieces of yellowtail, salmon, shrimp and tuna that arrives beautifully presented easily be shared by two to four. 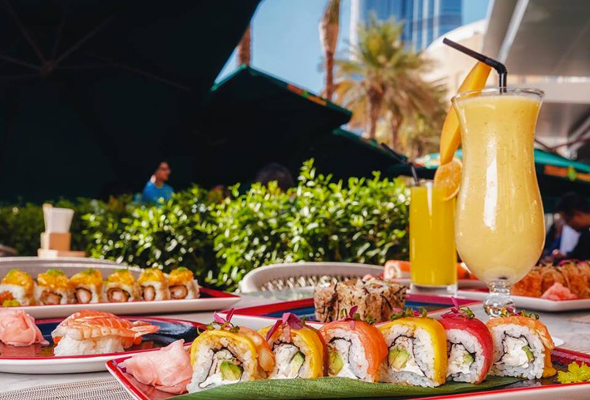 Sushi choices are varied, ad extend beyond the usual options to include a must-try California Hot (Dhs50), six pieces of warmed maki roll heaped with crab meat which you’ll wish you’d ordered seconds of and a crunchy Arigato (Dhs38) of shrimp, avocado, arugula and unagi sauce. The mushroom dumplings (Dhs19 for four pieces) are melt in your mouth bites of deliciousness, and both sides of the table are fans of the chicken and truffle xiao long bao (Dhs30 for two). Save room for dessert – we’re big fans of the soft mochi (Dhs17 per piece) which is offered in an array of flavours. Everything arrives in record speed, making this a brilliant mid-mall pit stop to fuel up with a view as you shop.